Today I welcome Anna of The Imagination Tree who is sharing her inspiring discovery boxes with us. When I first saw Anna post about the discovery box I thought, “Wow, that is such a great idea,” I love how wonderful they are for encouraging creative, open ended play! Young children learn about the world around them by exploring with all their senses. 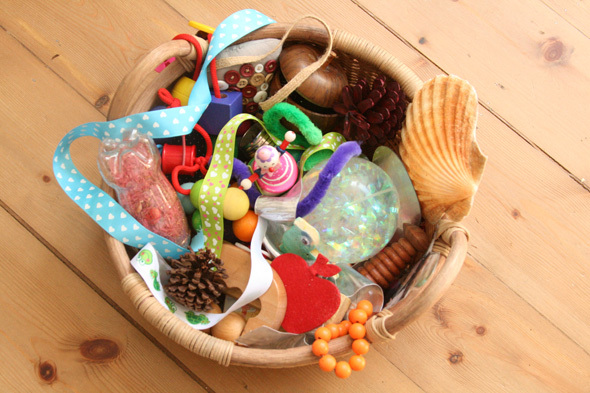 They need to be presented with a range of natural, tactile, multi-sensory objects to examine and investigate, rather than brightly coloured plastic toys with a noisy, one-function purpose, of which they quickly get bored. For babies it is really easy to put together a Treasure Basket in a matter of minutes, by gathering (safe) objects from around the home and garden and putting them together into a shallow, broad basket for easy access and exploration. Here are some ideas of the type of objects you can add to your treasure basket, and here are some ideas of what can be added to a basket for 12 months old plus. 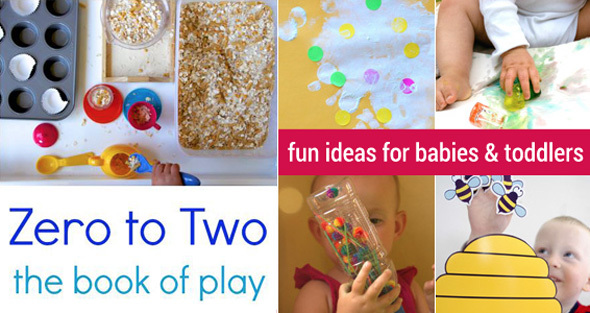 Here are two themed treasure basket ideas for older babies. This type of play is not new, in fact it is ancient. We refer to it as Heuristic play, meaning simply “playing with objects” and it’s as natural and cheap as can be. But the time comes when baby gets a bit older and starts to want to know what the objects can do, not simply what they feel like. That’s the time to introduce the Discovery Box! 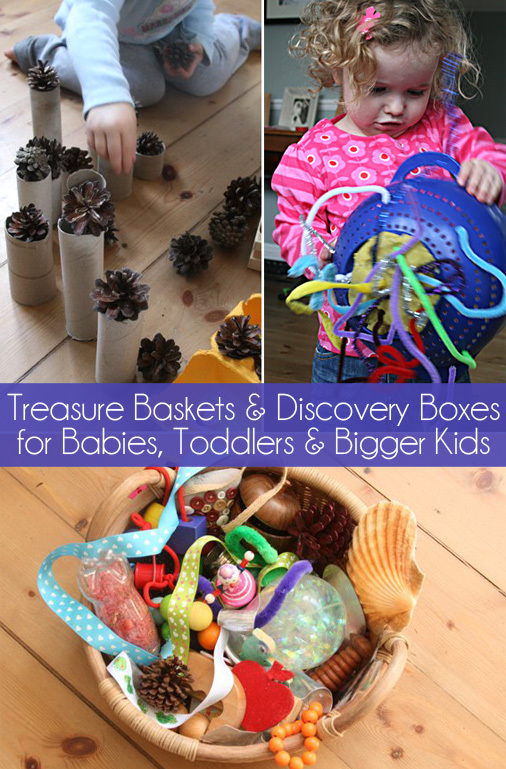 Discovery Boxes are the name I’ve given to some simple, open-ended collections of materials for my children to explore and investigate in any way that they like. The idea is that each collection should have a loose theme based around the way that the items will probably be used, for example, “rolling and stacking” “pouring and scooping” “sorting and matching” etc. 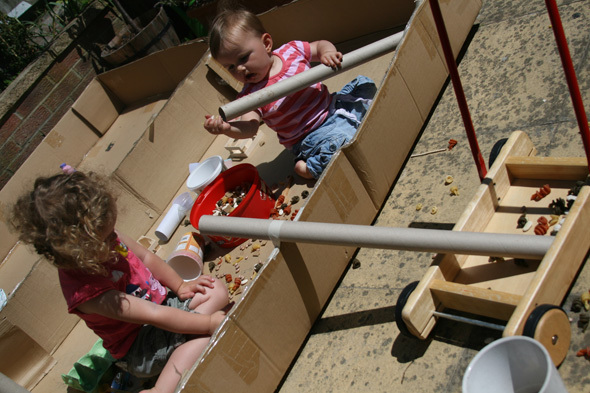 The role of the adult is to introduce the box/ bag of items and then step aside, allowing the child to investigate and play with them in an open-ended, free way. If the child wants the adult to join in and facilitate in some way then that is fine, but there should be no imposed end purpose or design placed on the activity, because we all know that as soon as we tell a child “let’s build this into a house this way” then they’re no longer interested and all creativity ceases. Pipe Cleaners: This box contained two colanders, a random plastic object with holes in it and a large amount of thick, coloured pipe cleaners. My daughter was 2.5 years when we played with this and she just loved the idea of sticking the pipe cleaners into all of the holes, trying to work them through and join the colanders together. She concentrated so hard on what she was doing and remained totally focused on her self-given play task for ages. This is one that we have come back to a few times and approached in new ways, and both girls still love it! Tubes, Tape and Beans: This was wonderful fun! It happened on a LARGE scale in the garden, in amongst two huge cardboard boxes. The girls were presented with a massive tub of dry beans, a collection of long and short cardboard tubes and some rolls of easy tear masking tape. I added in some cups, plastic tubs and half bottles too as the play unfolded as I could see the direction it was taking and that we might need more materials to satisfy their plans! With help from me (when asked, specifically) they created a plethora of ramps and chutes, tunnels and ways for the beans to be dropped down into tubs. They remained playfully entranced for a whole afternoon and this is another idea we have returned to, on a smaller scale, many times since. Pine Cones: These were sent to me in a big box by a fabulous blog reader and I just had to turn them into a Discovery Box! This was a simple as letting the girls open the box to find out what was inside, and then stepping back to see what they would do with them. I gave them some egg cartons and empty wooden crates, and they set about filling and emptying, lining them up and stacking. they fetched other materials and eventually turned it into an imaginative play game with a cafe serving pine cone cakes and coffee! They involved me totally in the play and we had a great time together. Discovery Boxes are pretty much free to put together and require no creativity on behalf of the adult, just plenty of investigative fun for the child as well as developing their critical thinking skills, problem solving, creativity, fine motor and independence! 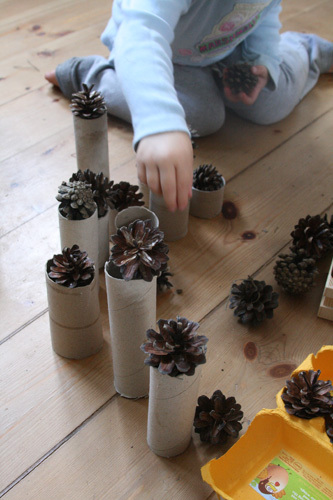 About Anna: Anna Ranson writes over at The Imagination Tree about ideas for creative play and learning in the early years. She is an early years and art teacher with 2 young girls, living in the UK. Thanks for reminding me that a treasure box isn't just for babies!